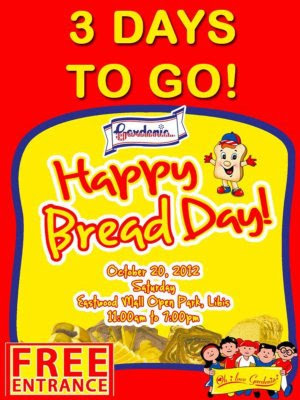 join the world bread day celebration on october 20! Breads is one of my absolute food favorite! I can go on for days with only bread, a perfect spread mate + coffee! I bet a lot of you foodies will agree! Oh well on such a delicious note, here is another delectable event you might want to partake, The Happy Bread Day! celebration happening this coming Saturday, 20 October at Eastwood Mall Open Park in Libis, Quezon City. Be in bread heaven from 11am to 7pm. This event is brought to you by no less that bread exprert, Gardenia. Oh + did I tell you it’s Free Admission? So bring your whole family + bask in all the awesomeness + delight that a warm loaf of bread has to offer. This entry was posted in announcement, free grub on 17.October.2012 by admin.